Some unexpected travel came out of the trip to London last month so here I am on the road again. Heading this time into the Middle East, a part of the world that has grown on me. Departures, especially those on long trips are now to be dreaded, regardless of how glossy the brochure extolling the destination, or the claims an airline makes via is model stewards about how much you are going to enjoy the trip. The maxim that the journey is more important than the destination might be good for your chicken soup guide for life but has zero relevance to long haul flights. Emirates seem to have slipped in a couple of extra rows since I flew with them last and I am unable to stretch out, testing my claims that I can sleep anywhere. 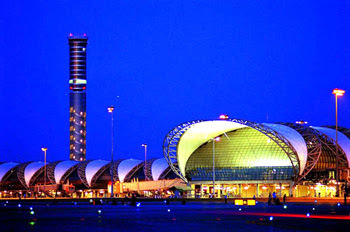 We bore out of Sydney and head for Dubai via Bangkok where I now sit after a brief walk around Thailand’s new airport. When I came through here for a couple of days last October we missed this new building by one day. Nearly a year on and it already shows wear and tear. Sadly it is another modern airport with nothing startling about the shiny chrome and glass and new concrete. The holding pens for all the seething, crying, bored, irritable stock are no different to any other holding pens in any other airport trying to attract then quickly churn as many passengers as possible. Here we all sit at 2 o’clock in the morning, badly wanting to nod off and not really able to in the plastic seats they have for us. This flight seems to have a lot of kids on it so our gritty eyed fatigue is accompanied by a symphony of sniffles, grumps and outright dissenting wails. I feel sorry for these parents who are stoic in the face of the assault. If I find the place drear, they must hate what it doesn’t offer for small kids trying to work out what is going on. But the diminutive Thai staff are good humoured and see us though and reboarded all with a semblance of good humour. For which we are all thankful. I had just endured one of the least pleasant aspects of travelling from Australia to Europe with QANTAS – the stopover in Bangkok. It is a tired airport that offers poor respite. But we were back in the plane and thundering down the runway heading for Frankfurt when suddenly we were thrown forward in our seats as the reverse thrust came on and the brakes were applied. The complete inability to do anything except hang in the seatbelt was remarkable. The g-forces were probably not that great but were sufficiently strong to overcome any ability to sit upright or move your arms. Turns out the fuel pump on one of the engines had failed so the crew elected to stop and replace it. 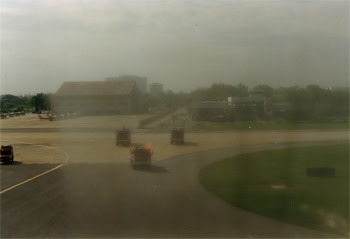 We stopped at the end of the main runway and blocked it for an hour as the brakes cooled down.The Thai fire crews rushed out, seen here approaching the plane (the humidity had fogged up the windows), all jumping out of the vehicles and excitedly pointing in the area of the nose wheel and the main undercarriage. The Captain came through a few minutes later and explained the brakes were “glowing cherry red” and we would stay where we were until they had cooled down. Five hours later we took off again. After enduring another painful four hours at Don Muang airport, Bangkok.